Sustainability. It's more than a buzzword. It is a crucial concept and an ambitious goal. Ducks Unlimited's bold conservation vision is based on sustainability. We are conserving and protecting wetlands and associated habitats, and we have done it better than any other organization for more than 81 years. 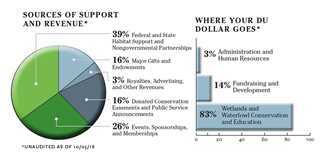 Thanks to the sustained efforts of volunteers and supporters like you, fiscal year 2018 (FY18) was another record year. FY18 marked the eighth consecutive year that we surpassed our budget goals, with total revenues exceeding $220 million. Yet again, our volunteer-led events provided outstanding contributions—more than 56,000 DU volunteers hosted over 582,000 attendees at 4,100 events across the United States in FY18, raising an impressive $66 million. Each year, Ducks Unlimited promises to spend at least 80 percent of all funds raised on our conservation mission. We exceeded that goal in FY18 with 83 percent of revenues going toward our mission. Our goal for the current Rescue Our Wetlands campaign is to raise a record $2 billion for wetlands conservation by the end of calendar year 2018, and we're on track to blow that goal out of the water! When we launched the public phase of the campaign in 2015, we knew it would take the efforts of every Ducks Unlimited supporter for us to succeed. 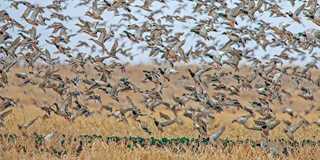 When the campaign concludes in December, DU will go down in history for launching—and successfully completing—the most ambitious wetlands and waterfowl campaign ever. We're putting those dollars to work right now. In FY18, Ducks Unlimited impacted (strongly affected) 328,000 acres and conserved another 277,858 acres, bringing our U.S. cumulative total to nearly 6 million acres conserved since we began U.S. conservation work in the 1980s. Throughout North America, more than 14.3 million acres have been conserved since DU was founded in 1937. 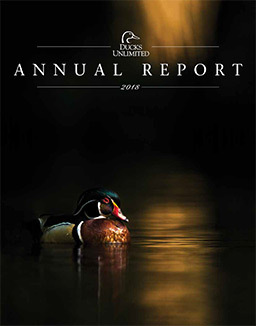 View and download the full Ducks Unlimited Annual Report in PDF format to read more about our many achievements and success stories in FY18. You can also view our Honor Roll of Donors. DU's youth and education programs continue to grow. In October 2017, Ducks Unlimited launched its National Scholarship Program. Dawson McLamb from Roseboro, North Carolina, received the first DU National Scholarship of $10,000. It's all about sustained effort. And Team DU would not exist without the commitment of volunteers, members, staff, philanthropists, foundations, and corporations, as well as partnerships with private landowners and state and federal agencies that share our conservation goals. Support also comes from advertisements, licensing agreements, and royalties. One special partner, Bass Pro Shops, received Ducks Unlimited's 2018 Corporate Conservation Achievement Award at DU's 81st annual convention in Indianapolis, Indiana. The award recognizes corporations from across North America for their exceptional contributions to conservation. Bass Pro Shops continues to support DU generously and in many ways. Their donations include more than 4,500 square feet of space for the DU Waterfowling Heritage Center in the Bass Pro Shops at the Pyramid in Memphis, Tennessee, and representation in the Wonders of Wildlife National Museum and Aquarium, which opened in 2017 in Springfield, Missouri. Founder Johnny Morris and Bass Pro Shops also promote DU on their race cars, providing significant visibility to the NASCAR audience. In addition, Bass Pro Shops has raised more than $750,000 for DU during an annual round-up month, empowering its customers to support DU's conservation mission by rounding up their purchases to the nearest dollar. In October 2017, Nestlé Purina PetCare Company became the newest corporate sponsor of the USA Rice–Ducks Unlimited Rice Stewardship Partnership. Through a $2 million commitment over four years, Nestlé Purina's investment will help keep working rice lands healthy, preserve wetlands, and create habitat for waterfowl and other wildlife. In January, Ducks Unlimited announced a $5 million contribution by Energy Transfer Partners (ETP) in support of wetlands conservation in Ohio and Louisiana. ETP's operations overlap with several of DU's priority landscapes, providing excellent opportunities for the company to support DU's conservation work. FY18 was another successful year for DU in our nation's capital as well. In December 2017, Ducks Unlimited held its inaugural volunteer public policy training and fly-in. Nearly 50 DU state chairs, state policy chairs, senior volunteers, and board members from 26 states gathered in Washington, D.C., to advance DU's public policy priorities. The volunteers received training from DU's governmental affairs team and attended meetings on Capitol Hill. During the three-day event, DU volunteers had over 100 visits with congressional leaders. More than 400 people attended a reception in the Senate, celebrating DU's partnerships and conservation legacy. These are only a few of our many achievements in FY18. You can find out more about our mission and work at ducks.org. Thank you for your continuing commitment to Rescue Our Wetlands, to Ducks Unlimited, and to our conservation mission, which provides sustainable benefits for waterfowl, other wildlife, and communities across North America.